The most powerful man in the global oil industry was just fired, and crude oil prices are falling in response. At 9:45 a.m. today (Monday, May 9), WTI crude oil prices were down 1.2% and trading at $44.15 a barrel. Last week, the U.S. benchmark broke its streak of four straight weekly gains by falling 2.7%. Futures for June delivery are now down 3.9% in May. Brent crude oil prices were also volatile this morning. The global benchmark declined 1.6% to $44.66 a barrel. Futures for July delivery tumbled 4.2% last week and are now down 5.7% this month. On Saturday, May 7, Saudi King Salman restructured some of the Kingdom's biggest ministries. Changes included replacing the high-ranking governor of the Saudi central bank and creating new departments like the Commerce and Investment Ministry. But the biggest change was the replacement of Ali al-Naimi, the oil minister in charge of the country's energy policy since 1995. Khaled al-Falih, the chairman of the state-owned oil titan Saudi Aramco, was sworn in to take his place. The Ministry of Petroleum will also be renamed to the Ministry of Energy, Industry, and Natural Resources. The change in leadership marks an even sharper change in the country's crude oil policy. While al-Naimi was a main facilitator in the fight to freeze output in Qatar last month, al-Falih has been determined to fight for his country's market share at any cost. "If prices continue to be low, we will be able to withstand it for a long, long time," al-Falih told CNNMoney earlier this year. "Obviously we don't hope for that, but we're prepared for it." The government overhaul is the first step in the country's plan to reduce its growing $98 billion budget deficit. In fact, if the Kingdom doesn't figure out a way to make money in this low crude oil price environment, the IMF says it could be completely broke in five years. Saudi Arabia will focus on non-oil sources of revenue to alleviate the country's growing debt crisis. Last month, Deputy Crown Prince Mohammed bin Salman said the Kingdom hopes to raise at least $100 billion a year from economic areas outside the energy sector by 2020. That would be more than triple the Kingdom's current non-oil revenue, which includes money from several tax measures and expatriate programs. The biggest target of the new model – a part of the larger "Vision 2030" economic plan – is energy subsidies. These are given by the government to energy employees as a payment for the damaging effects of low crude oil prices. For example, the government gives yearly bonuses to oil workers as a form of subsidy since low prices reduce his company's profits, which could lower his yearly salary. However, the crude oil price crash has forced the Saudis to save money wherever possible. 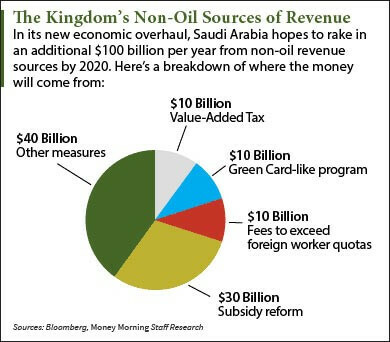 That's why the Kingdom plans to save roughly $30 billion over the next four years by cutting back subsidies. Saudi Arabia's new economic model is a historic transition for the world's largest oil exporter. After all, exports constituted 70% of government revenue in 2015. But this model makes up only half of the country's plan to get out of debt. In fact, Saudi Arabia has also announced it will sell a portion of its "crown jewel" to the public. 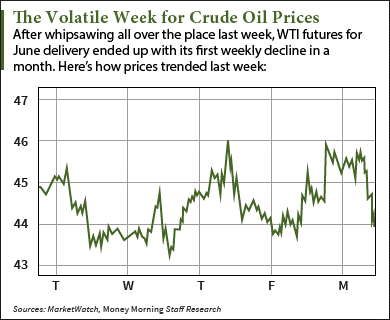 Alex McGuire writes about Saudi Arabia and crude oil prices for Money Morning. You can follow him on Twitter here. To stay on top of the biggest financial news, follow Money Morning on Facebook here.